Here are a couple of more shots of Puerto Ayora. 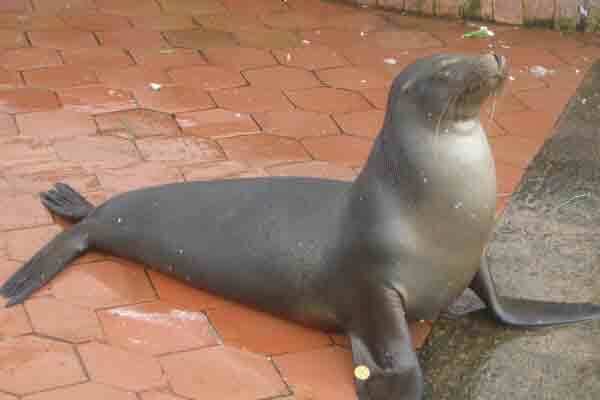 This sea lion has it made! It lies around the fresh fish market and feasts on the leftovers as the fisherman process their daily catches. Then it snoozes all afternoon. This is one of the few occasions when we saw it awake and active. 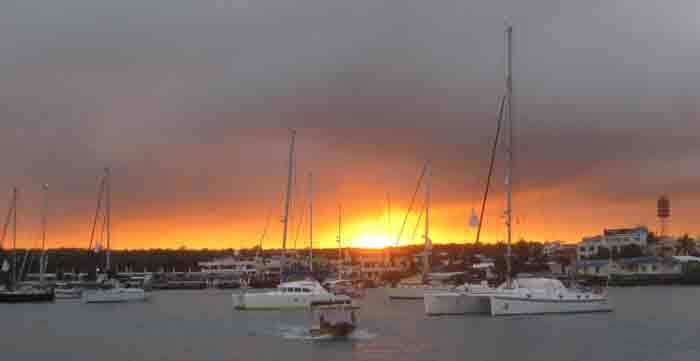 Dave captured this lovely sunset over the anchorage. It looks so tranquil. However, we have seldom found such a rolly spot in which to anchor. One big advantage is that you don't need to use your dinghy at all. You just whistle down or call a water taxi to take you ashore! Last Sunday we had a lovely lunch at Angermeyer Point. We then walked a LONG way over uneven lava rocks to what we thought was a beach, but turned out to be a grotto, Las Grietas, where the water was fresh and cool. It was a short but very impressive swim. 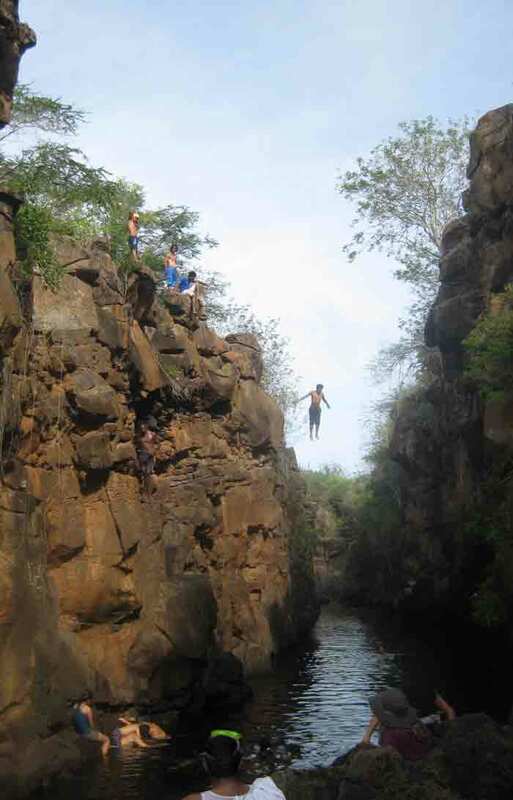 Local daredevils spent the afternoon jumping off the cliffs. A couple of corrections from former blogs as well. Those were not BATS which were clicking at nights on the passage from the Perlas. They were actually Swallow-tailed Gulls. They are nocturnal. No wonder the reflected bioluminescence made them look like glow in the dark butterflies! Also, the little lizard with the red throat is a Lava Lizard. Only the females have the red throat. The males are larger and plainer- an anomoly in the animal world, I believe. The baby bird in the last entry is a Galapagos Magpie. On Tuesday Night there was a harem-themed surprise party to celebrate Jeremy (from CHSALONINA) 's 50th birthday. Disguising himself as Neptune was the limit of Dave's dress-up tolerance and he was NOT going to dress up as a harem girl. Accordingly, we didn't go to the dinner on Kiosk Street, even though we had paid for it. Accordingly, we were the only couple from the two cruises who had a good night's sleep. Apparently, our travel agent in the United Kingdom (UTRAVEL) did not pay our fees 60 days before the cruise and, in fact, no money had come through by sailing time. Dave and the other skippers spent MANY tense hours at the local tour office until it was finally agreed that we would pay the cost again and when the fees came through the charges would be refunded from the credit cards (thus incurring additional transaction fees). Then we learned that the Port Captain was not allowing us to leave the port as the restaurant from the night before was claiming $500.00 had not been paid toward the dinner. Eventually it was down to about $180.00 and the fees were paid and we FINALLY set off many hours late for our cruise aboard the CORAL I. It had looked such a small unimpressive boat in the harbour, but, after an hour long coach ride, followed by a small ferry crossing and another short bus trip, we finally reached our dietination. Our rooms were lovely and spacious. The saloon was lovely (with air conditioning! ), the dining room attractive, the meals GREAT and the service impeccable. We are all so glad we went! To try to salvage the first day, we sailed to our intended anchorage for the night,Dragon Hill on Isla Santa Cruz. There we went ashore to look for Land Iguanas. There are two kinds of iguanas in the Galapagos, Land and Marine Iguanas. They share the same DNA but have developed in totally different ways. The terrestrial type is golden brown with a thick, rounded tail. They live off the island vegetation and burrow under the ground. They are also very large. Marine Iguanas look like they could play the orcs in Lord of the Rings. They live on the black lava and blend in so well with their dark colouration, you almost step on them, even when there are literally hundreds of them lying on top of and beside each other. Their body temperature is quite low in the mornings, but, as they heat up, they finally start moving and then they ALL head for the sea. They eat only green algae and can dive to 30 metres for it and can stay down up to an hour. When they surface, they can expel excess salt from their bodies by sneezing it out. Unfortunately, it was raining so hard that first day we could not get a good photo of the land iguanas, who were mostly in their burrows trying to keep out of the rain.